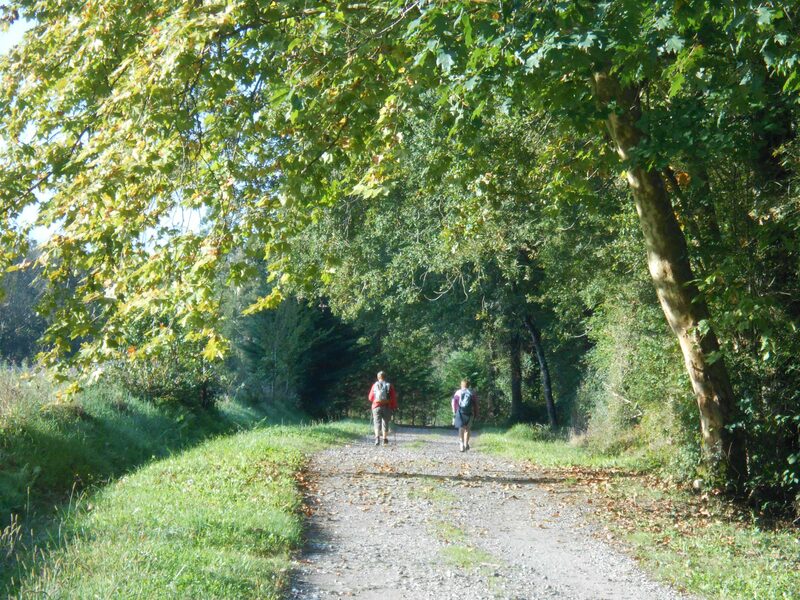 sandiegotosantiago | A pilgrimage along the Camino de Santiago – the Way of St. James. I am the type of person who likes to think things through before setting out on a course of action. When it came to walking the Camino, this meant that I spent quite a bit of time setting up a notional plan for my pilgrimage. I thought about how far I might hike each day, where I might stay each night, plus a pile of other related information. There has been a fair amount of discussion on the Camino forums about this sort of pre-planning. The two primary schools of thought seem to be a minimalist approach, with little pre-planning, and a more detailed approach, with considerably more planning. A lot of this has to do with your personality and the amount of comfort or anxiety you might feel as you prepare for your journey. The minimalist school says that if you are a “true pilgrim” you will not think things through so much and will let the adventure unfold as it will. “The Camino will provide” is a commonly heard epitaph. 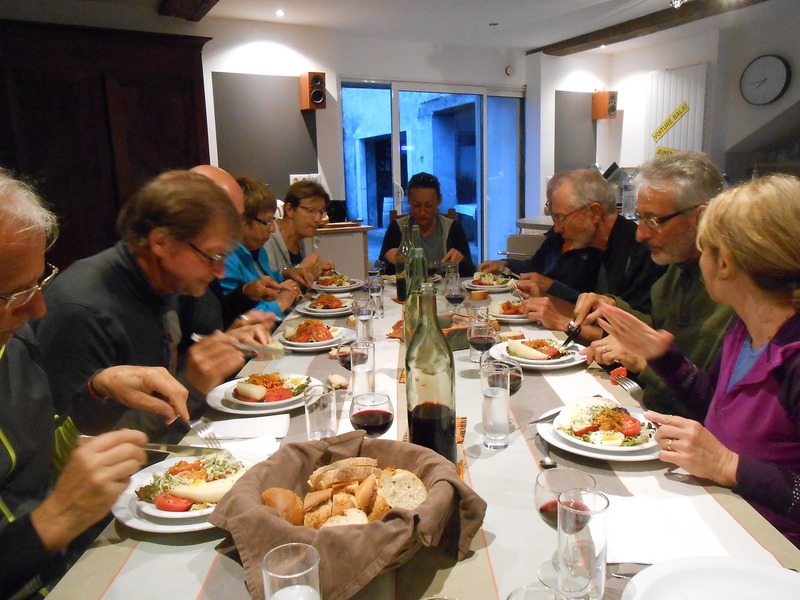 This group of people feel that too much thought about the details detracts from the Camino experience. On the other hand, I am a member of the detailed planning school since I like to have some idea of where I will be on any given day and feel a little anxious about just setting out and letting nature take her way. It’s just a reflection of my personality. My plan was laid out in a calendar format and included lots of information such as the calendar date, the destination town for the day, the number of days since the start of the pilgrimage, suggested lodging, the number of actual walking days to date, the daily distance in miles and kilometers, the total distance walked to date, the distance remaining to reach the end of the pilgrimage, a reference to the associated guidebook map, and the total days in the EU. Once the planning was done I had an excellent idea of where I would be at any point along the way. But, I want to reiterate that my plan was just that – a notional plan – not a blueprint that had to be precisely followed. I felt totally free to deviate from my plan as needed and adjust expectations as I made my way toward the ultimate destination of Santiago de Compostella. I thought it might be fun to share with you how the original plan looked and how the actual plan played out. So, I have included two images here that illustrate the point. The images show the plan for my pilgrimage during the month of September as I had it laid out prior to my trip and the actual plan as I marked it up to reflect my actual experience. You can see that the best laid plans of mice and men are often quite a bit different from reality. So, I guess my take-away from this is to recommend that any future pilgrims plan as much or little as they feel comfortable with, but above all, be prepared for changes along the way. I never stressed out about any of the changes. They just helped me, on my personal journey, keep track of where I was along the way and understand what additional changes might be in order going forward. Bon Chemin et Buen Camino! I had a interesting experience on the Via Podiensis the other day – one that I don’t care to repeat. But, in the interests of fair and open journalism I have decided to share it with you all, my dear readers. 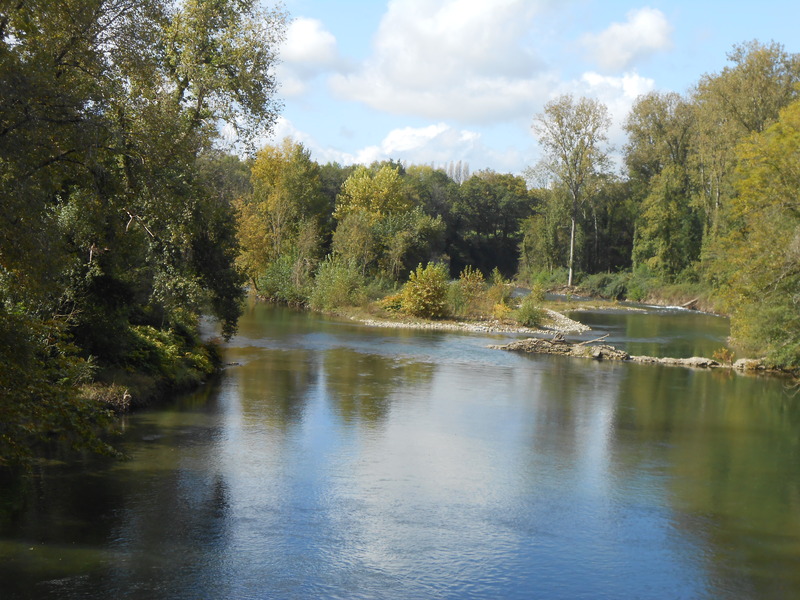 During my initial planning for this walk months ago, and based on recommendations I had received months ago, I had decided at this point to leave the GR65 for a day and take a variant route to the town of St. Palais. I had my route all planned in advance, based on the maps shown in my guide book. 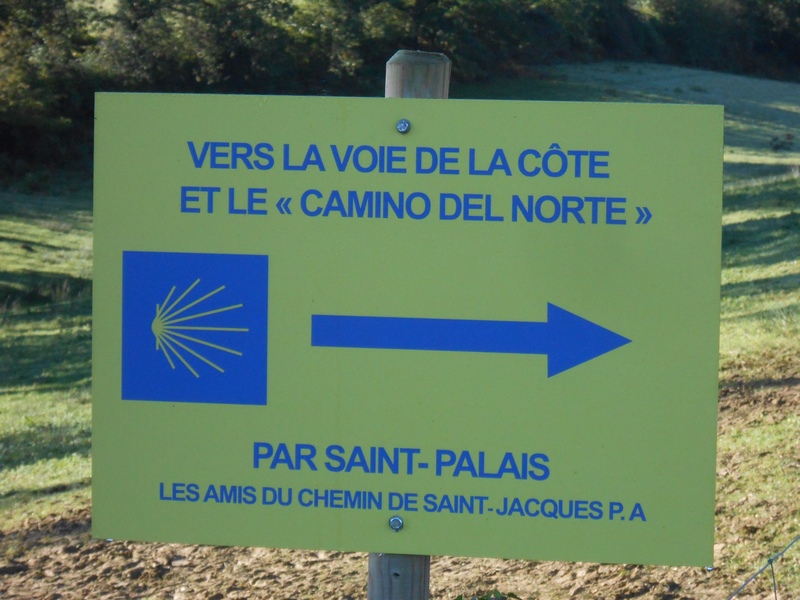 But, at breakfast that morning the owner of the gite where I had spent the night pointed out that there was now a new “shortcut” that had been created by the local Amis de la Chemin de St. Jacques (Friends of the Camino) that would save me 2km. That part sounded pretty good, so I decided to take a chance and follow the new shortcut. I was assured that the turnoff to the shortcut would be well marked and impossible to miss. There was to be a large yellow sign pointing out the way. Well, that part was correct. I found the sign right where it was expected to be, made the turn, and started down the road that was to save me 2km. (You can tell where this is going, can’t you?) 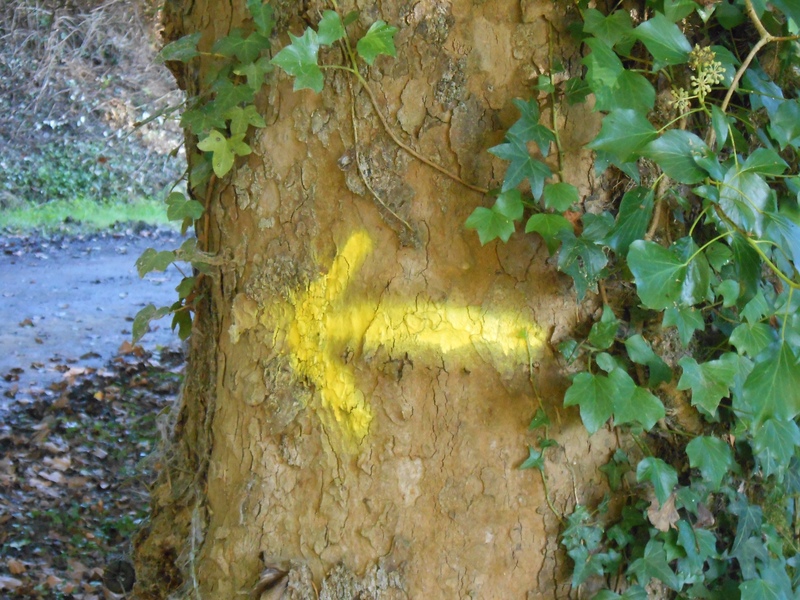 Well, in a kilometer or two I saw yellow arrows painted on trees, similar to those used in Spain for Camino directions, pointing down a road through the woods to the left. So, down the road I went. This road turned out to be the muddiest trail of my entire Camino due to many tractors that had recently been up and down the road, chewing up the dirt and turning it into a veritable quagmire. The consistency of this mud was similar to wet concrete. There was no way to keep from getting my boots totally mucked up. After a kilometer or so of this mess the road sort of evaporated in a newly harvested field with no obvious way forward. I guess I could have turned around and gone back, but I still thought I was on the new “shortcut” trail and couldn’t bring myself to face that muddy road again. So, onward I trudged through the field hoping the trail would soon reappear and in no time at all found myself hopelessly lost with no clear way forward. I was only sure that I didn’t know where I was or which way to go. I saw a fence line in the distance that I thought (hoped) might have a road next to it and headed that way. Long story short, I ended up crossing three fields, fought through tangled underbrush and thick blackberry briar thickets, had to ford a creek (boots got totally wet there), and dealt with at least three nicely installed barbed wire fences. The fences and my backpack just didn’t get along and, at one point, I ended up on my back in the muddy wet field with my backpack caught in the barbed wire. I might add that there was blood involved in this fiasco – thankfully, not much. At moments like this you really start to question why you are doing this and what you will do next. The only thing I was sure of was that I had to do something and couldn’t just give up and stop. That just wasn’t an option. I was lost in the woods and there was no one else around to help out. It was up to me to figure out a way to extract myself from the current situation. To put it simply, it was not a pleasant situation for me. Anyway, after battling the fences, fields, mud, woods, and briars I finally made it to the aforementioned fence line and, lo and behold, there was a farm road there. I breathed a huge sigh of relief. I wasn’t going to die in the forest alone, except for the wild animals. But, which way to go. I consulted my Miam Miam Dodo guidebook and picked the direction I thought would be best and might hopefully lead to a more prominent road and some sort of civilization. But, to my surprise, after walking a while, I saw one of the white and red GR65 trail markers! I was somehow back on the GR65! That was a hopeful sign, but I still didn’t know in which direction I was going. Was I on the road toward St. Palais or back toward my gite from last night? Well, after 15 minutes or so, I saw a sign beside the road, which was another hopeful development. But, upon reaching it I discovered that it was the original yellow sign announcing the “shortcut!” I was right back where I started after my “lost in the forest” adventure and it was an hour and a half later! So much for this “shortcut.” I’m thankful it wasn’t any worse than it was. But, it was an hour and a half of misery. It did add some color to my adventure and, given that I survived relatively unscathed and now knew where I was and, given that it was really the first time on the whole trek that I was truly lost, it wasn’t all that bad. At a minimum it gave me an interesting war story to tell. Later in the day I spoke with another pair of pilgrims who also got lost following this shortcut. So, I guess the moral of the story is, don’t trust a last minute shortcut recommendation unless you have sufficient time to check it out for yourself. I don’t know what it is about St. Palais and getting lost, but it seems to be a fairly common occurrence. I have read several reports of other pilgrims getting lost while taking this variant. This is mostly because the route is unmarked and you have to rely on your map reading skills which, in the actual moment, may fail you no matter how good you think they are. 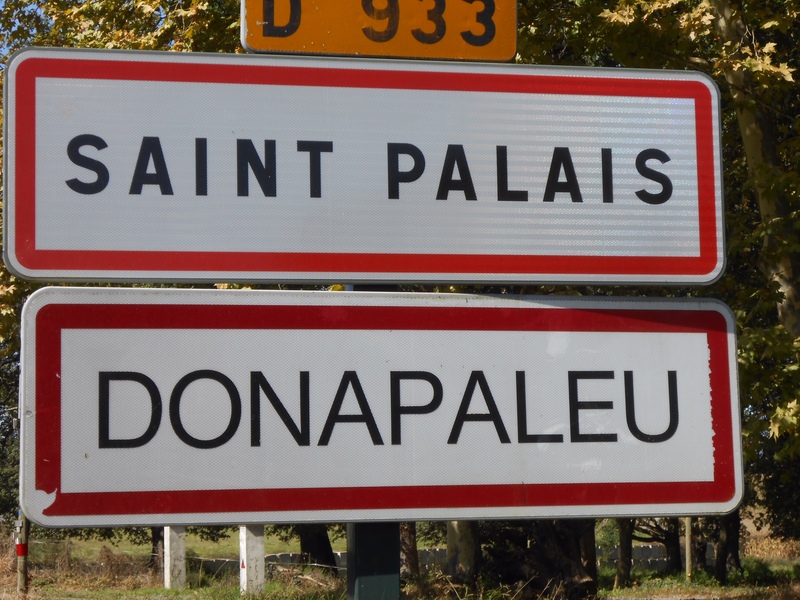 In fact, Later in the day I made a second wrong turn and, while it wasn’t as momentous as the first one, it did cost me another 2-3km before I finally actually arrived in St. Palais. Before it was over my hoped for 16km day probably ended up taking something more like 25 km! Ouch! However, one beautiful thing happened as I trudged into town. After my earlier mistakes I wasn’t especially confident and still felt a bit lost. So, I stopped in a store to ask for directions and a sweet lady – a customer – said she knew where my gite was located, loaded me into her car, and personally drove me the final few blocks! Who says the French aren’t wonderful, giving people. This lady was a true Camino angel! Bless her! So, after all this, what did I think of St. Palais. Well, I was totally underwhelmed. It’s a nice enough town, I suppose, and has a lovely church, but not worth a special detour to visit, in my humble opinion. 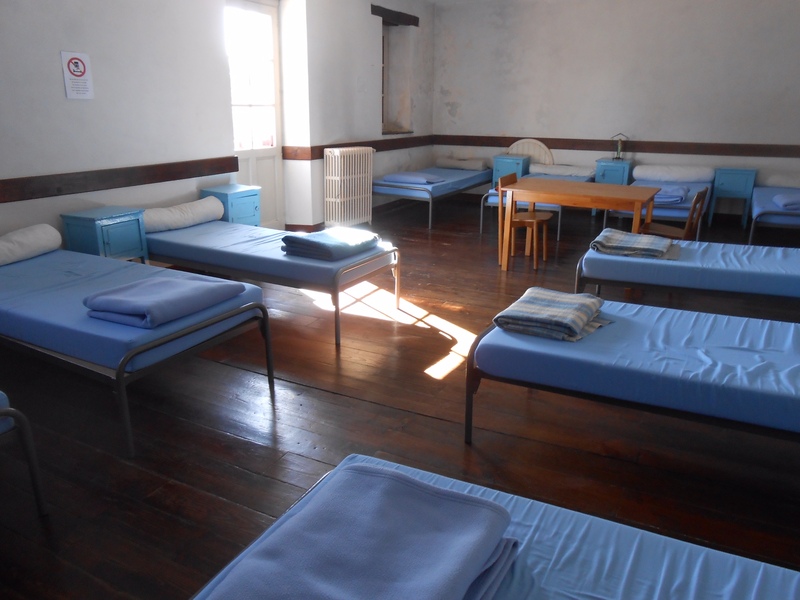 One other nice thing was that I was the only pilgrim in the gite 12 bed dormitory. No one snoring! The last couple of days have been very pleasant for walking. There have been a few more hills to navigate up and down, but the scenery has been beautiful with new pastoral vistas around every corner. There were a few short showers yesterday, but today was warm and sunny – perfect weather for walking. I have found that the days are blending together and I’m finding it difficult to keep the individual towns and gites clear in my mind. They are all tending to meld together into one amorphous whole. I’m trying to help them retain their individuality, but it’s difficult. So much has transpired over the past 36 days. I made it to Aroue today and have only three more days until I reach St. Jean Pied de Port. Yesterday’s walk ended in the town of Navarrenx (which is one of the most beautiful towns in France – a sign upon entering the town will tell you so.) 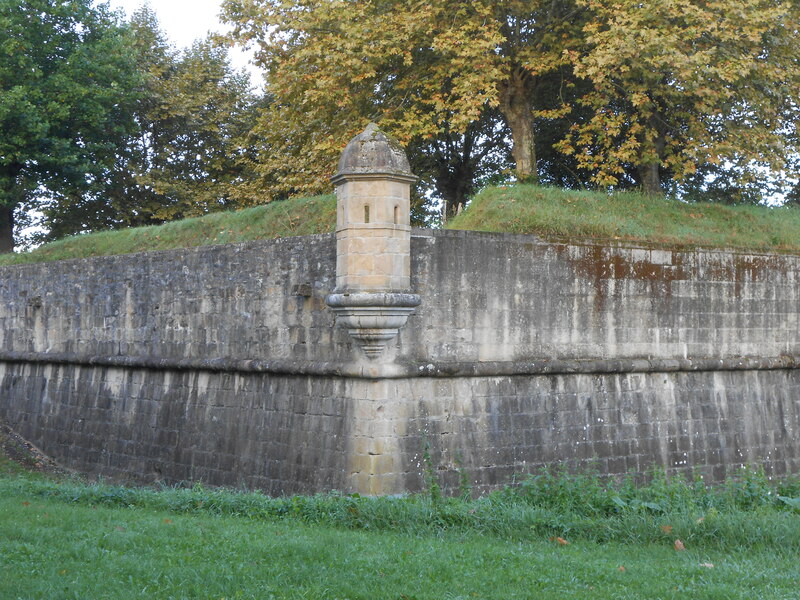 The town’s fortification walls are still standing and are pretty much intact. 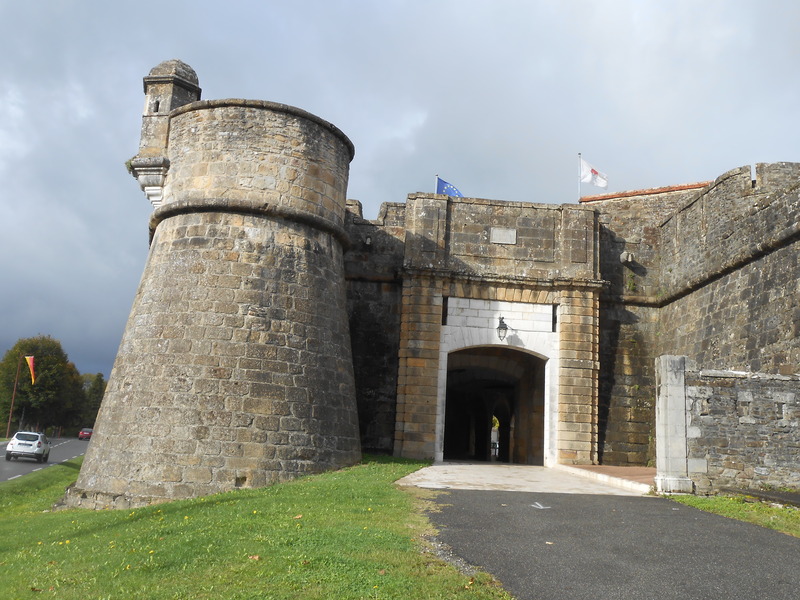 I was especially taken by the old Porte Espagna (Spanish Gate.). The townsfolk take a lot of pride in their town. 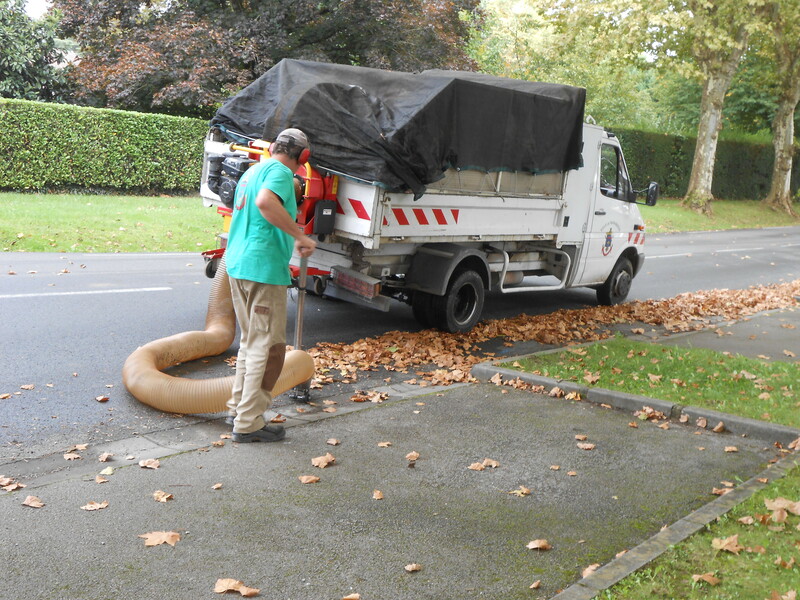 I saw one team of city employees vacuuming up the leaves that had fallen onto the street! I could use their help a home although I suspect it is a losing battle. 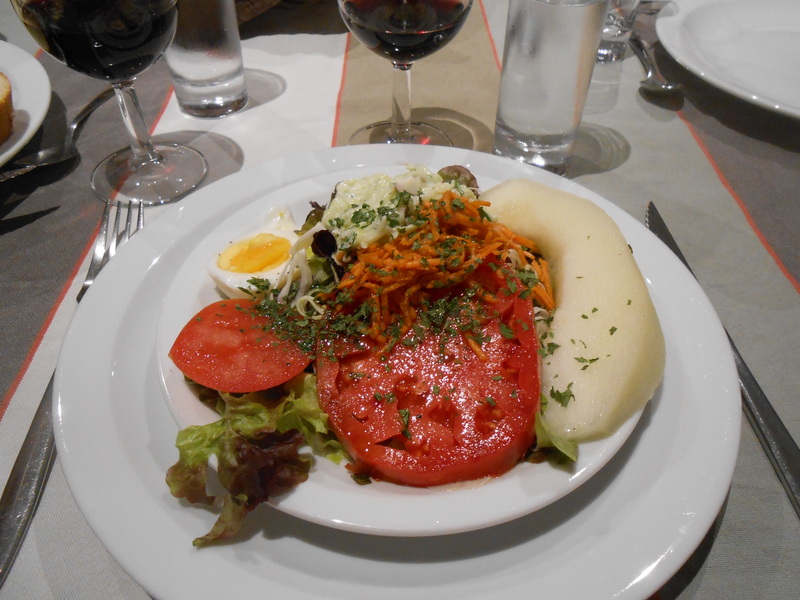 I also enjoyed a wonderful dinner of salad and seafood soup at the Gite Le Cri de la Girafe in Navarrenx. 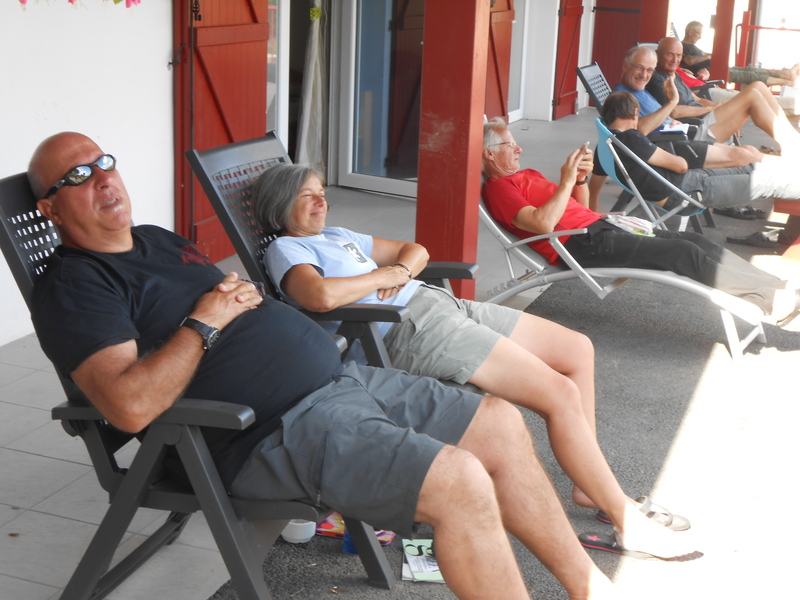 It was a very nice gite – clean, recently remodeled, and with wonderful hosts: Fabian and Maria. Tomorrow I will be taking the variant to St. Palais. The variant is unmarked, so I hope I don’t get lost! Bon Chemin! 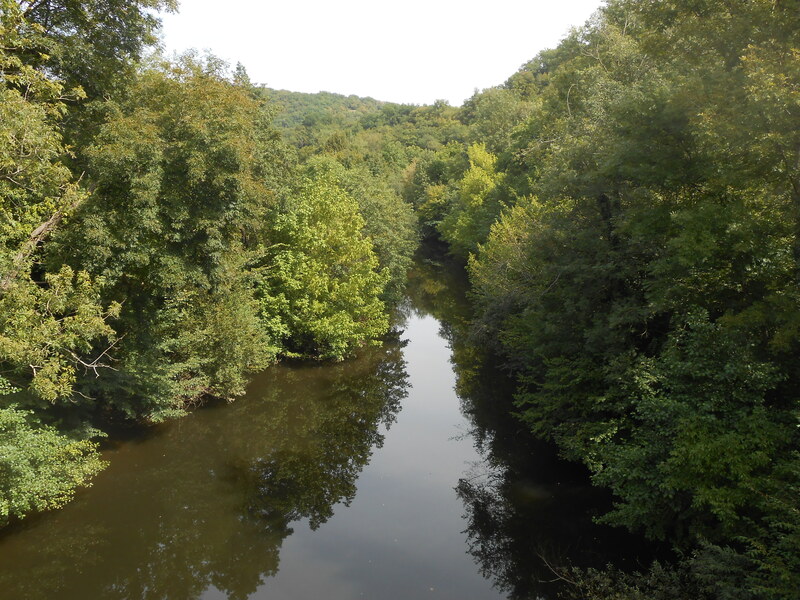 At this point in my journey I am only a week away from my primary destination goal of this walk – the town of St. Jean Pied de Port – the point where the Camino Frances begins. I have been walking now for 34 days and have covered almost 650 km (400 miles) which means I only have about 135 km (85 miles) left! It is exciting to realize that this adventure will soon be over and that I will be wending my way home shortly. After a lot of soul searching (there’s plenty of time for that while walking alone all day long) I have pretty much decided to stop walking once I get to St. Jean. A Sunday stroll of 790km (495 miles) is probably enough for an old guy like me. I don’t need to prove anything by walking another 790km all the way to Santiago. After all, I already walked that Camino three years ago. However, I would still like to obtain a Compostella from the Cathedral in Santiago – the document certifying that I “officially” completed my pilgrimage. So, after arriving in St. Jean Pied de Port I am planning to travel by various means to the town of Sarria, Spain, which is just beyond the 100km minimum distance required for obtaining the Compostella. That portion of the Camino will present a real culture shock to me since large multitudes of pilgrims begin their walk there – all of them in hopes of also obtaining a Compostella. I am so used to walking alone almost all the time that the congested trail from Sarria will take some time for adjustment on my part. Since my last posting I have traveled through some of the most beautiful towns and countryside in France. 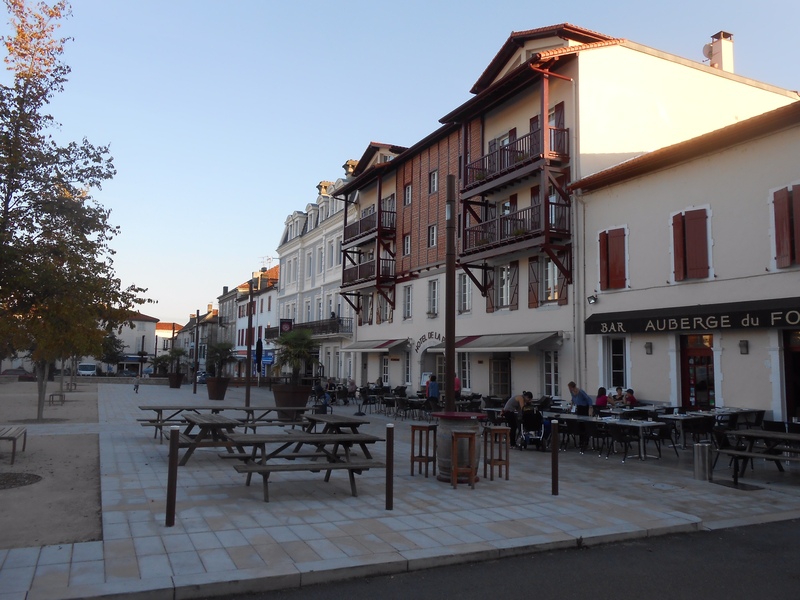 Many of the towns have been designated as “one of the most beautiful towns in France” and most of them are justified in claiming that designation. 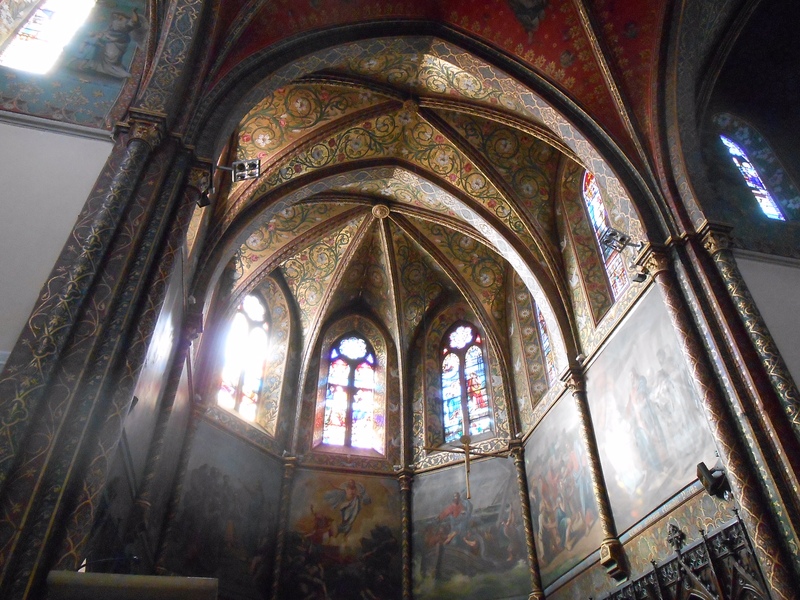 The churches and cathedrals are beautiful in a majestic, stately way. They don’t have the stunning gold altar pieces (called “retablos”) that you see in Spain, but they have a true beauty all their own. I try to at least peek inside every church (from cathedrals to tiny village chapels) that I pass along the way and am rarely disappointed. To be honest, this trek has been decidedly less spiritual than the pilgrimage through Spain a few years back, but the frequent visits to these houses of worship, which are almost always open, is uplifting and provides a spiritual element I otherwise find missing. The walk and the people are lovely, but it’s just not a particularly spiritual pilgrimage. Last week I had my first taste of rain. It showered briefly on and off for a couple of days. But, then it decided to rain steadily for several hours as I approached the town of Lectoure – hence the title of this posting. Walking in the rain is a unique experience. It’s not especially bad, but it’s also not my favorite thing to do. But, you have to keep walking, so onward into the rain you go. During this rainy day my rain gear (poncho, primarily) kept me and my pack dry, but my boots were wet and quite muddy (on the outside only, thank goodness.) I arrived at my gite in Lectoure dripping wet and the gite owner was kind enough to let me in early so I could drop off my pack and hang up my poncho to dry. Such is life on the Camino. Since then, there have been a couple of short showers and lots of threatening skies, but no serious rain. I hope that trend holds for the next week or so. I am writing this from the medieval city of Conques, which is the most beautiful town in France. If you don’t believe it, there’s even a sign as you enter the town that will tell you so. In fact, this is the third “most beautiful town in France” I’ve been to this week. But, I can tell you… this one really is the most beautiful so far! It has delightful twisty, turny streets and timbered facades, like something out of Charles Dickens. There are very few straight lines and square corners in the village center, which only adds to its charm. 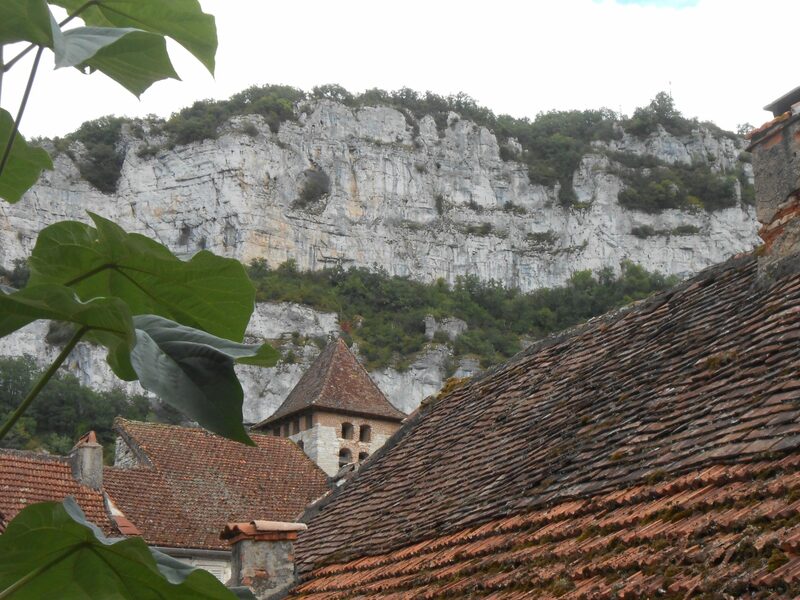 In the heart of the village is the magnificent Abbey Church of St. Foy. The tympanum above the main doors is one of the gems of 12th century French art and contains 124 separate carved figures depicting the last judgment in vivid detail. Many of the figures are shown going to their glorious heavenly reward. Others are not faring nearly as well. It is simply stunning in its detail and artistry. Tucked in around the edges of the tympanum are curious little figures who look like they are trapped behind the stonework and are peeking out, perhaps looking for a way to escape. The church itself has soaring interior vaulted ceilings and lends itself to the spiritual reflection and worship for which it is intended. I attended vespers a short time after arriving and compline (with a pilgrim blessing) later in the evening. Very spiritually fulfilling. I chose to take today off as a rest day and rode the bus in from Estaing around noontime yesterday rather than walking. 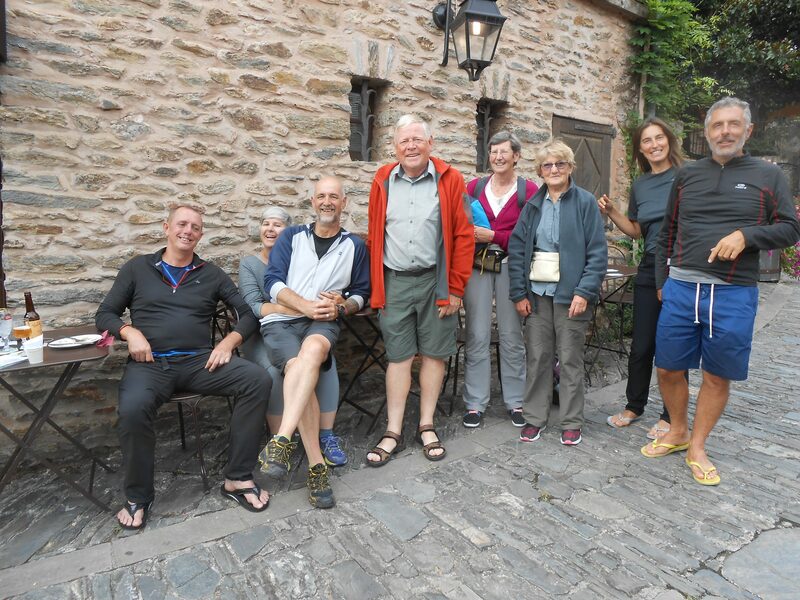 Since arriving in Conques I have been able to reconnect with perhaps a dozen of my Camino acquaintances. I keep hearing people calling out “Robert” and I meet up again with another familiar pilgrim. (In France, that’s pronounced “rho-bear”, by the way – and don’t forget to roll that “r” a little, if you can.). I am feeling revitalized and now know that it was a good decision to sit rather than walk today. Tomorrow I plan to resume the walk. I have been told that it’s not as brutal from this point on. Whew and thank goodness! In the week or so leading up to today I have been humbled by the Camino. The first day was especially difficult since the straps on my backpack were not adjusted correctly and I was not in any semblance of trail shape. I experienced some doubt as to whether I could actually do this pilgrimage. But things improved remarkably after the straps were adjusted and the excruciating aches and pains disappeared. My confidence returned! So far, it has been an exceptionally beautiful walk. But, the steep, rugged ascents and descents have been very challenging and the heat (90 degrees or so) for the past couple of days are what led up to my decision to sit one out for today. In addition, rain had been forecast for today, but it didn’t amount to much. Over the next several days I have been told the temperature and the trail difficulty will both moderate a bit. 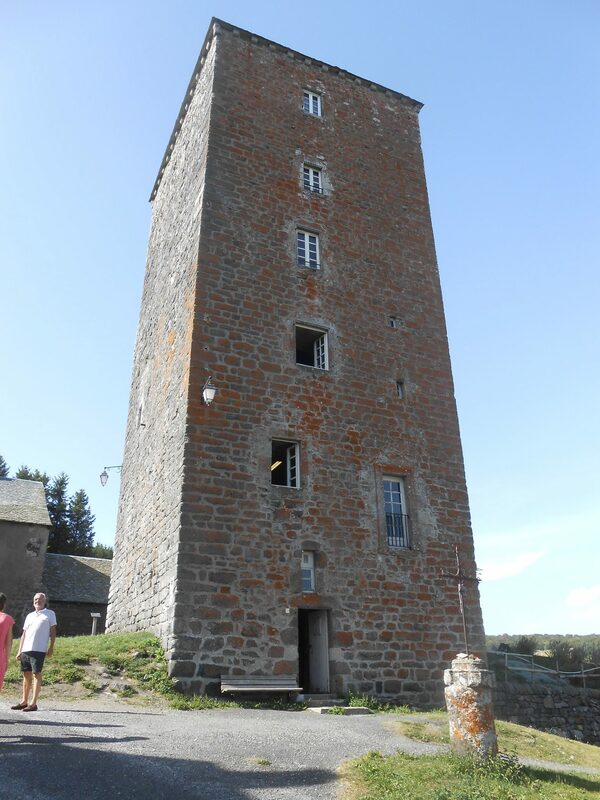 Since leaving Le Puy en Velay I have crossed the Aubrac plateau and the Lot River valley. 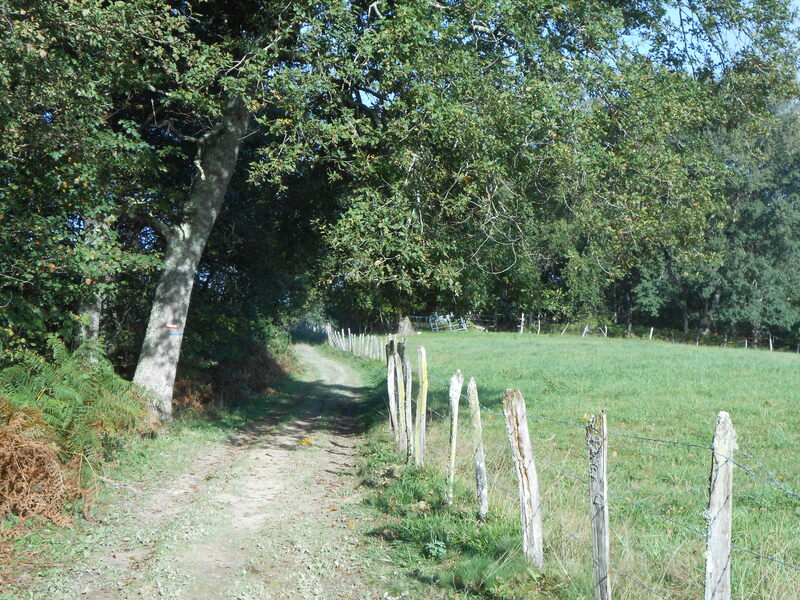 In the Aubrac, which many consider the most beautiful portion of the route, I found myself within a vast pastureland and lovely wooded forests. In several stretches I shared the trail with bovine herds, walking right among the cows. There were warnings not to touch or otherwise startle the cows and definitely not to walk between a cow and her calf. So, I was careful but didn’t have any problems. The herds were gentle and docile. All they seemed to be interested in was eating the grass and chewing their cud – such well developed cheek and jaw muscles! My guidebook says that as many as 50,000 head of cattle live in the area – the most common breed being the beige long-horned Aubrac. (No surprise there.) I think I saw most of them. The sound of cowbells was a constant pastoral companion. Most of the cattle are bred for meat, but the region is also noted for its cheese, which we are served at the end of dinner just about every night. The Lot River valley and portions of the Aubrac have been designated as UNESCO world heritage sites, for good reason. They are incomparable. I have been staying in “gites,” which are the communal accommodations on the Via Podiensis, similar to albergues on the Spanish portion of the Camino. The main difference, is that I have also been requesting “demi-pension” when offered. (It just about always is.) 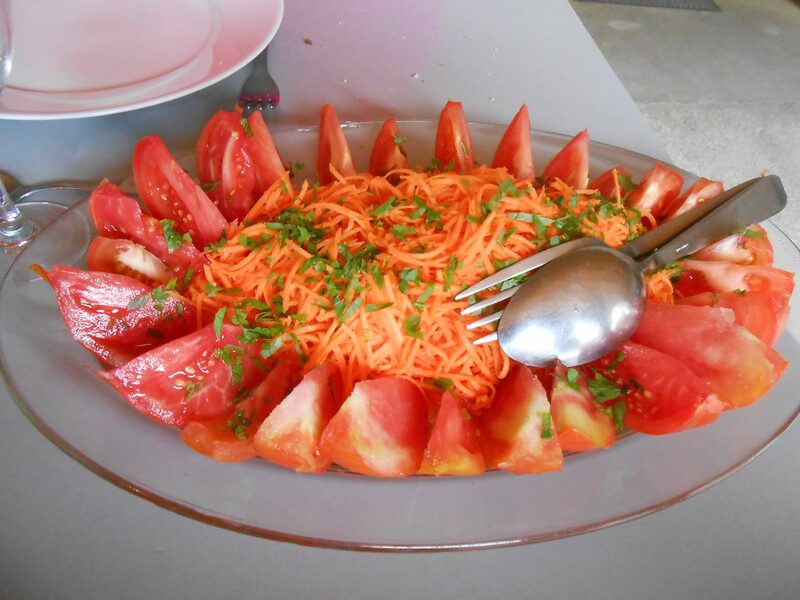 With the DP option, you are served a family-style dinner, cooked in the family’s kitchen and often featuring regional specialties. You also are served a typical European breakfast in the morning, consisting of coffee, juice, toast, butter and jam. 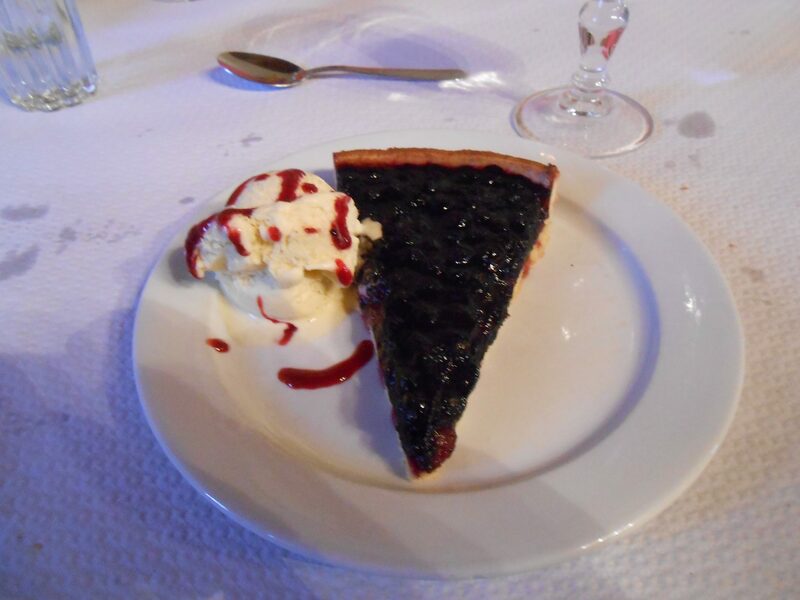 The overall quality of the food has been excellent – the French do love well-prepared food – and the convenience can’t be beat. 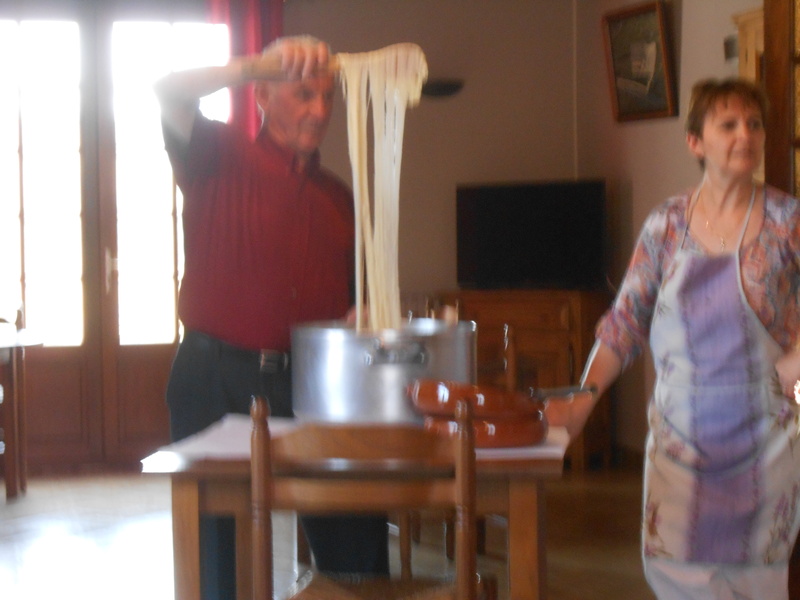 It is during these communal meals that the Camino families really start to form. 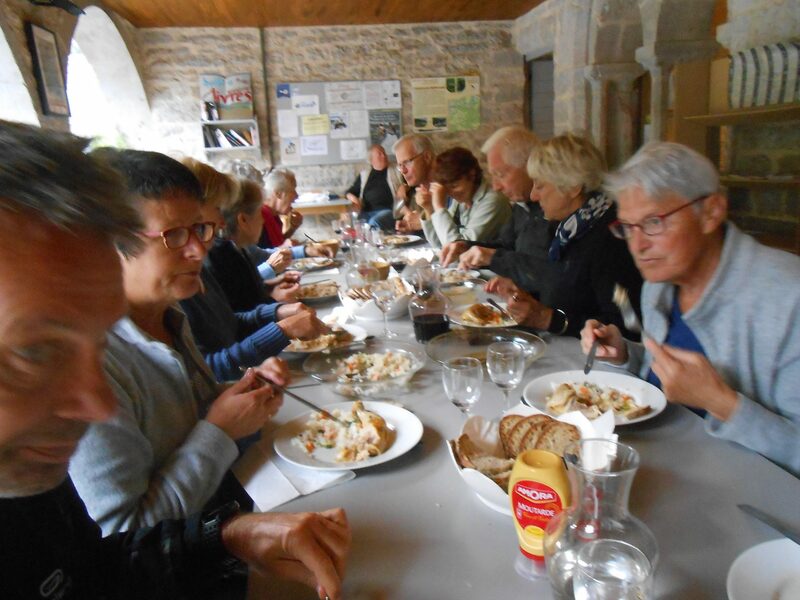 French is the language spoken, but I’ve discovered that even a little French goes a long way and the other pilgrims go out of their way to include you in the conversation and make you feel welcome and part of the group. I will strive to post a bit more frequently as the days go by. It’ll be more likely if the trail and weather really do moderate.